시민 참여로 수집한 정보로 다양한 주제의 지도를 만드는 사단법인 커뮤니티매핑센터(이하 커맵)의 마포구 사무실에는 벽에 지도가 많이 없다. A3 용지만한 서울시 지도와 세계 지도가 달려 있는 것이 전부다. 사무실 벽에 종이 지도가 별로 없다는 건 상징적이다. : 실제 모든 커맵 지도는 온라인에 축적되어 있다. 커뮤니티 매핑의 사전적 의미는 ‘공동체 지도 그리기’다. 공동체에 의한, 공동체를 위한 지도 그리기다. 시민들이 지역 사회 개선을 위해 특정 주제에 대한 정보를 현장에서 수집하고, 이를 지도로 만들어 공유하고 이용하는 과정을 말한다. ﻿﻿﻿﻿﻿오늘 회의의 주제는 2016년 구글 임팩트 챌린지 지원금으로 개발한 베프지도에 대한 홍보 전략이다(참고로 BF.ZIDO의 BF는 ‘barrier-free,’ 즉 고령자나 장애인이 불편을 느낄 수 있는 장벽을 허무는 운동의 약자). 2018년 5월에 출시된 장애인 접근성 지도인 베프지도는 커뮤니티 매핑을 통해 데이터를 공유하고 축적하는 웹사이트이자 앱이다. 회의에 참석한 노재천 이사는 “지금은 소프트웨어가 많이 안정화됐기 때문에 적극적으로 홍보해야 돼요.”라고 말한다. “모든 사람이 참여할 수 있도록 홍보 방법을 확보해야 해요.” 직원들은 임완수 대표와 함께 홍보의 형태(동영상? 카드뉴스? )와 대상자(종교 단체? 장애인 단체? )에 대한 토론을 한다. 과일도 먹으면서. 커뮤니티매핑센터는 2016년 구글 임팩트 챌린지 4개의 우승 단체 중 하나다. 5억 원의 지원금은 2013년 커맵이 설립되기 전부터 지속적으로 해오던 장애인 접근성 지도 사업에 엄청난 힘을 실어 주었다. 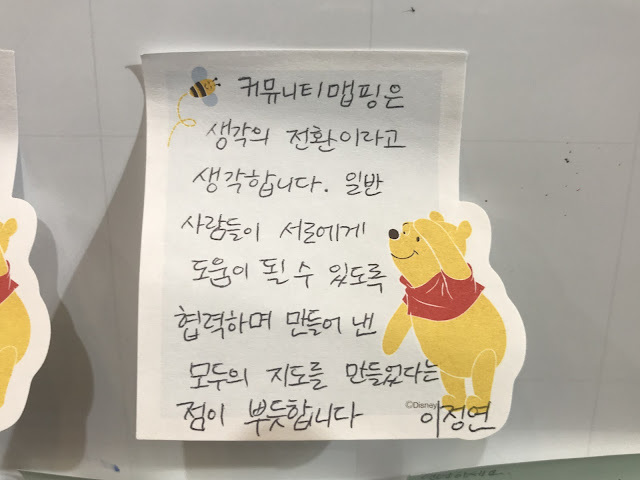 임 대표는 “구글 지원금으로 베프지도가 나왔다. 옛날에는 산발적으로 커뮤니티 매핑을 했는데, 베프지도를 개발함으로써 데이터가 한 곳에 모이게 됐다.”라고 말한다. ‘시민 참여형 장애인 접근성 지도 만들기’는 커맵의 가장 중요하고 오래된 사업인 동시에 단체의 핵심적인 가치이기도 하다. “장애인의 복지를 위해 커뮤니티매핑센터를 했고, 항상 저희가 가던 길들 중 하나입니다”라고 임 대표는 말한다. ﻿단체가 공식적으로 설립되기도 전인 2012년에 서울 숭덕초등학교 학생들과 함께 교통 안전에 대한 지도를 만들며 장애인 접근성에 대한 요소를 포함했고, 2017년 서울 화장실 지도 만들기 캠페인에도 장애인 편의성에 대한 정보값을 넣었다. 커맵이 지속적으로 쌓아온 장애인 접근성에 대한 연혁들은 구글 챌린지 우승 이후 베프지도를 개발하며 뼈가 되고 살이 되었다. 표면적으로 베프지도는 앱/웹사이트 개발 프로젝트다. 하지만 더 깊은 의도는 사회가 가진 장애인에 대한 인식의 변화를 유도하는 데에 있다. 지도 그리기에 참여함으로써 장애인과 비장애인 간에 공감대를 형성하고 우리 사회가 ‘정상=비장애인’이란 편견을 건물과 도로 등 구조물을 통해 어떤 방식으로 유지하고 있는지 적나라하게 보여준다. 커맵의 주요 매핑 참여 대상자 중 하나는 학생이다. 임 대표는 “남을 배려하는 매핑 과정들을 학교 커리큘럼에 계속 넣는 게 꿈입니다”라고 말한다. 이미 일부 교과서에도 실렸다(예: 4학년 2학기 사회 교과서, ‘안전지도 만들기’). 커맵은 설립 이래 총 69개의 학교와 협력해왔고, 이 중 29개교와 장애인 관련 프로젝트를 진행했다. 커맵은 2018 평창 패럴림픽 때 개최지 근처의 장애인들에게 ‘편의 시설 지도 서비스’를 제공하기도 했다. 국민대학교 자원봉사자 학생 100여 명과 함께 진행한 이 서비스는 학생들이 강원도에서 조사한 3,500여 개의 데이터에 사진을 추가하고 강릉, 정선, 평창 지역 1,000여 개의 장애인 편의 시설 등을 검사한 후 제작되었다. 수치로 보는 베프지도의 영향력은 아직 작아 보인다. 다운로드 수는 약 3,500회이고 매핑에 참여한 사람은 3,000여 명이다. 축적된 데이터는 36,157건이다(2018년 12월 기준). 커맵은 지난 몇 개월간 끊임없는 시행착오와 사용자 피드백을 수렴해 플랫폼을 개선하였다. 이제 비교적 안정화된 베프지도에 대한 홍보는 지금부터 시작이다. 1980년대 후반부터 지리 정보 시스템에 대한 연구를 계속해 온 임완수 대표는 커뮤니티 매핑계의 베테랑이다. 미국에서도 1994년부터 VERTICES라는 커뮤니티 매핑 센터를 운영해 오고 있다. 2012년 허리케인 샌디가 불어닥쳐 당시 뉴욕과 뉴저지 일대에 기름 대란이 벌어졌을 때, 그는 학생들과 함께 커뮤니티 매핑으로 만든 지도를 시민들에게 실시간으로 제공했는데 거기에는 지역의 주유소 정보가 들어 있었다. 매일 5시경 미국에서 대학교 업무가 끝나면 그는 저녁부터 커맵 팀과 화상회의를 시작으로 새벽 1시경까지 ‘한국 일’을 한다. 고된 일상에 대한 얘기를 들은 후 커뮤니티매핑센터를 시작한 것을 후회한 적이 있느냐고 물었다. Ironically, there aren’t a lot of maps on the walls of Community Mapping Center (CMC)’s office in Seoul. There’s an A3-sized map of the city and another of the world. It’s symbolic that there aren’t many physical maps in the office: CMC, which collects various data points using participatory, crowdsourced mapping, has all its maps online. 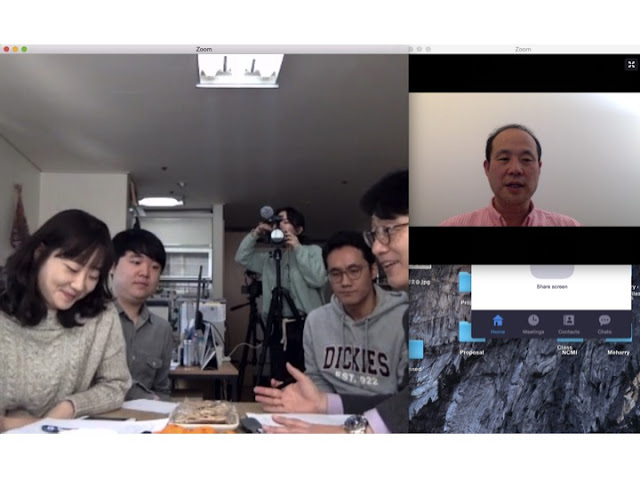 On a Friday morning around 11 a.m, six CMC employees sit around a large computer screen to video chat with their CEO and founder, Wansoo Im. It’s still 8 p.m Thursday in Nashville, Tennessee, where Im resides. “We chat like this everyday,” he says. “Once you get used to it, it’s as if I’m there in person. The only thing is, I can’t eat the fruits on their table.” Im has been living in the U.S. for the past 30 years, working full-time as associate professor at Meharry Medical College. In the evenings, he does the “Korea work” for CMC. Once every two months or so, he returns to South Korea to meet the team in person. Today’s meeting revolves around promotional strategies for BF.ZIDO, a newly developed platform made possible by winning the Google Impact Challenge (GIC) in 2016. BF.ZIDO is literally a ‘barrier-free map,’ aiming to ease the difficulties in mobility for elderly citizens and people with disabilities. The app/website, launched in May 2018, utilizes user mapping data to create a database of which public spaces are convenient for use. “Our software is stable now, so we need to start promoting the platform more actively,” says director Jaechun Noh at the meeting. “We need to develop strategies that can encourage everyone to participate in the mapping.” Together, the team discusses different strategies (a promotional video? Digestible social media posters?) as well as target audiences (religious orgs? Groups related to disability rights?). And of course, eating the fruits without Im. Citizens recording public spaces on BF.Zido in the city of Daegu in 2018. Even when a mapping project wasn’t explicitly about disability rights, Im made efforts to incorporate the cause into other projects. For example, before CMC was formally established as a nonprofit, Im was collaborating with an elementary school in Seoul in 2012 to map students’ neighborhood. He consciously included data values about public accessibility for disabled people. Experiences like these became important fodder for CMC’s plans to develop BF.ZIDO. On the surface, BF.ZIDO is a project to develop an app and a website. But the deeper purpose is about changing the way South Korean society perceives and experiences disability. In pushing citizens to participate in the mapping process, the project connects people with and without disabilities, while showing how society’s prejudices about ‘Normal=No Disability’ are structurally embedded within our buildings, roads and other infrastructure. CMC’s offline campaigns have been vital to the online mapping process. Since the center was established, it has organized a total of 385 mapping events and campaigns, including around 8,000 participants. Among them, 53 campaigns were specifically for disability rights and accessibility to public spaces, with around 2,400 citizens. At a typical CMC mapping event, people with and without disabilities work together to map public spaces in their communities, taking pictures and making other observations, such as, ‘This restaurant has stairs that aren’t wheelchair accessible,’ ‘This bathroom is very convenient for people with disabilities,’ or ‘This public bathroom is supposed to be wheelchair accessible but is locked.’ Together the mappers explore various corners that are often passed without a second thought. Seoulites participating in a BF.ZIDO mapping campaign in July 2018. One of the most important target audiences/participants of CMC’s mapping projects are students. “I want to continue to promote our mapping projects for school curricula, so students can learn to be considerate of others,” says Im. CMC projects have already been included in some textbooks, including a fourth grade social studies book about “Creating a Safety Map of Our Community.” Since its establishment, CMC has worked together with 69 schools nationwide; among them, 29 schools collaborated in specifically disability-related mapping projects. During the 2018 Paralympics in Pyeongchang, CMC provided a mapping service about the accessibility of public spaces near sports venues. 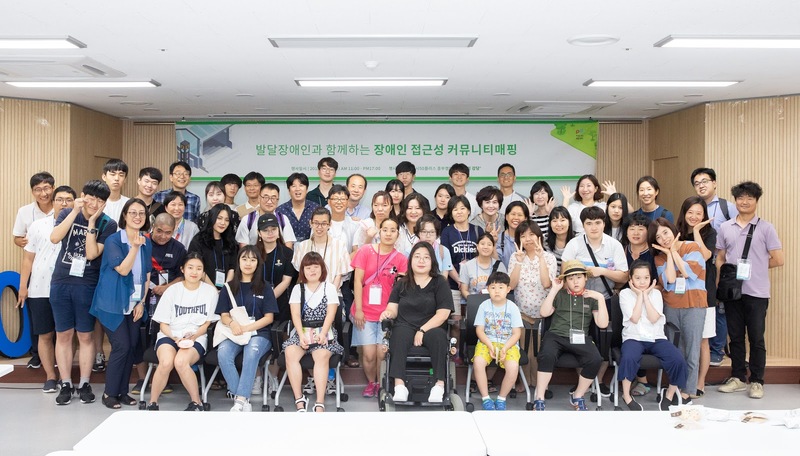 Around 100 volunteers from Kookmin University helped record the map, which included around 3,500 data with pictures of 1,000 public spaces in Pyeongchang, Jeongseon and Gangneung. In numbers, BF.ZIDO’s influence still appears small. The app has been downloaded around 3,500 times, with around 3,000 users participating in the mapping process. Over 36,000 data have been collected as of December 2018. After its launch in mid-2018, CMC has continuously refined the platform through user feedback, trial and error. Now that BF.ZIDO operates more stably, the team wants to start promoting it to the world. Wansoo Im is a veteran in the world of community mapping. He has studied the Geographical Information System since the late 1980s and has been running a community mapping center called VERTICES in the U.S. since 1994. In 2012, when Hurricane Sandy led to a gas shortage in New York and New Jersey, Im created a crowdsourced map with his students to locate open gas stations. Everyday Im works at his university until 5 p.m and everyday he starts his CMC work in the evening, early into the morning. After hearing his work schedule, I ask him if he has ever regretted starting Community Mapping Center. “Everyday,” he answers immediately.